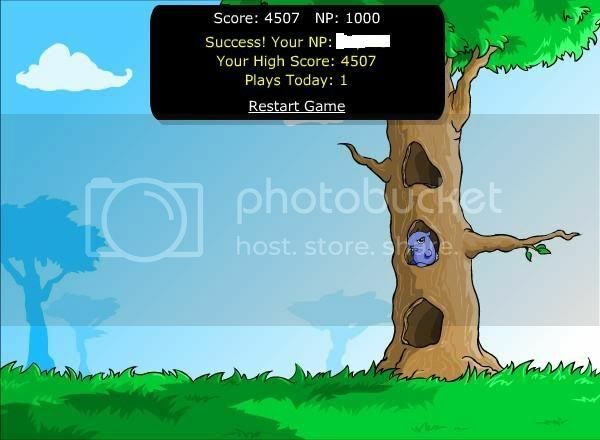 If you type the word meepits while playing, you will earn an extra life. Also, if you type in juice-o-matic, the Meepit timers will reset. On the title screen, If you click the eye of the green Meepit trying to hide behind the yellow one at the top, it plays a sound and shows someone with a green Meepit on their head. Pipes have a starting value of one point a piece. There are three colors of starting pipes. Red, blue and yellow. If you connect the right color juice to the Meepit the pipes are worth two points each. 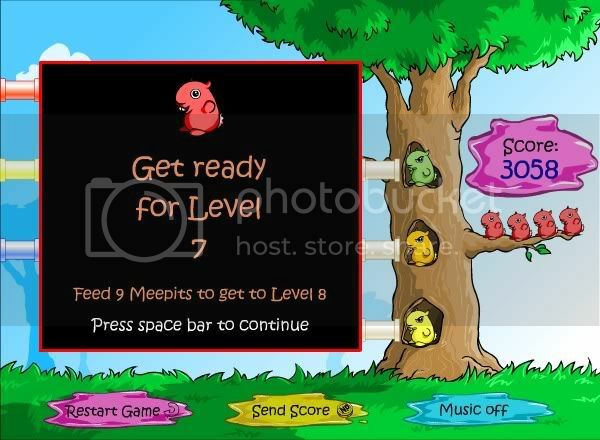 In the first of level you get one Meepit to feed at a time and plenty of time to do it. 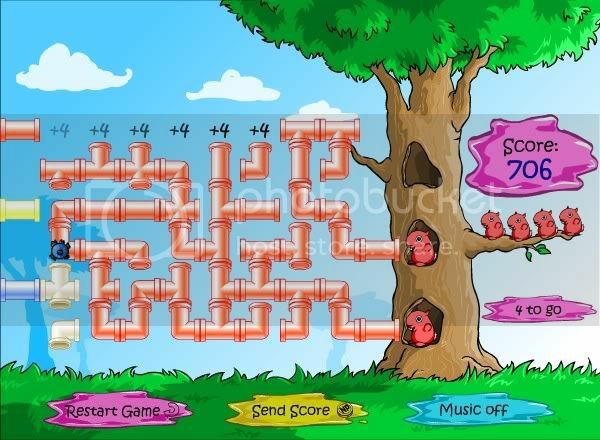 If you can connect all the available pipes you get 50 bonus points. You need to get about 400 points per level to get this avie. 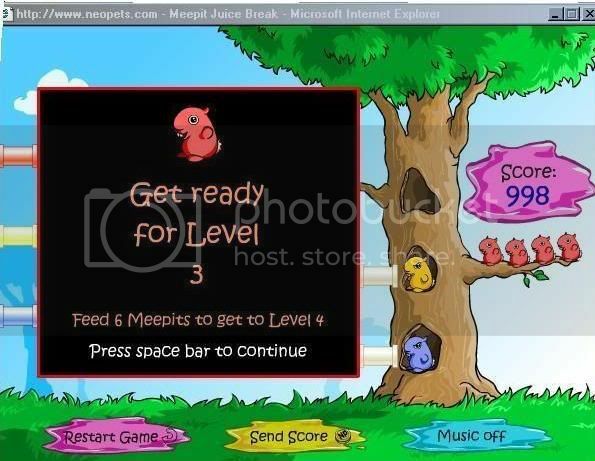 By the time you get to level 9, you only have 10 seconds to feed the meepits. At level two you will get two meepits per time. Try to feed them both together. If one is red and one is blue and you feed with yellow the pipes are only two points each. If you can feed with a matching color you get three points per pipe! IF you get two matching Meepits, i.e. 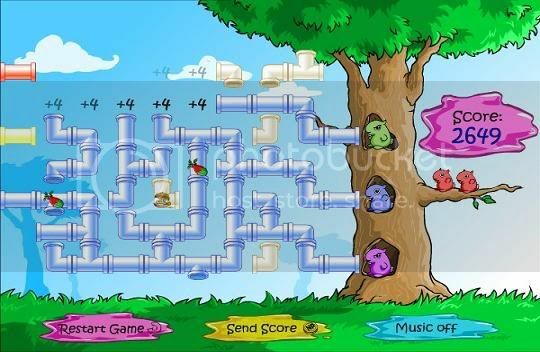 blue, and you can feed them both together with blue you get 4 points per pipe!!! 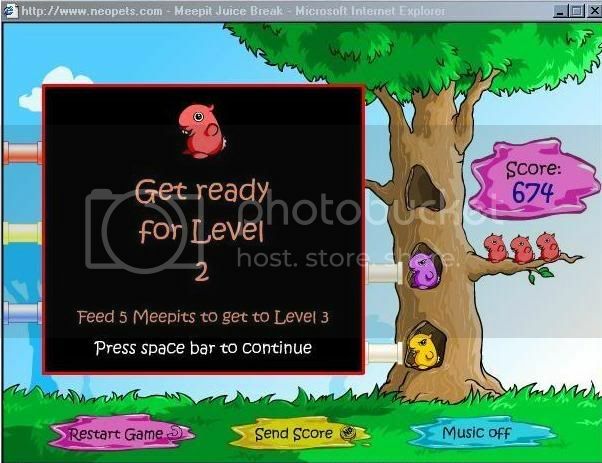 Level FIVE is when you start getting three meepits to feed at a time. All the above rules apply. Feed all three at the same time with one matching juice, 4 points each pipe. 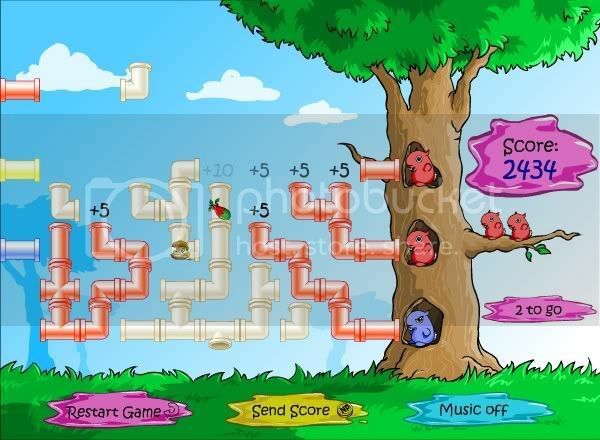 If two meepits match and you feed all three with a color that matches the two, the pipes give you 5 points each. 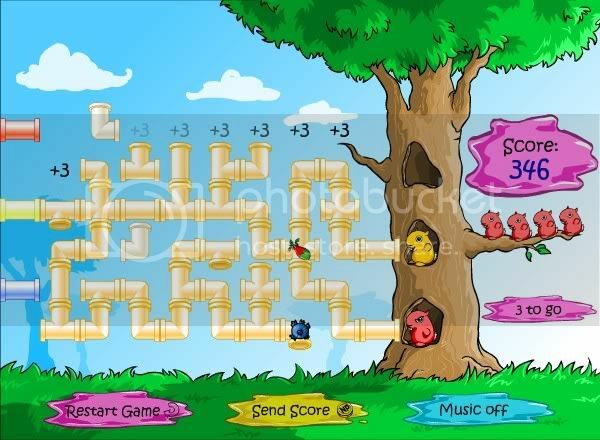 IF you get three color matching meepits and you can feed them with a matching color you now get 6 POINTS PER PIPE!!!!!! REMEMBER also that at any level that you can use all pipes you get a 50 point bonus!!!! Got all that down? Now add this. You will see pipes that have symbols on them. The red and green berry like symbol is worth 10 extra points. The blue bomb looking symbol is worth 25 extra points! Try to use these whenever possible. The rotten apple symbol will deduct 10 points. Try to avoid this, but if it will connect a plus 25 pipe then you gain 15. Red, blue and yellow make pink. You can connect the feeding pipes the same way you connect the meepits. Using these methods I regularly score 4000 or better without problems.